Heritage Walk Project: Completed by Birkenhead Town Centre Association Inc. Photo courtesy of All Saints Anglican Church. Copywriter; Louis Prouting. In 1908, Anglican Church services took place in the original Foresters Lodge Hall. Situated in Hauraki Street (now Hinemoa Street) in Highbury, it was a building constructed from native Kauri. Services continued there until a meeting on 1 September 1910, resolved "That the time had arrived when the Church of England should take the steps forward of purchasing a suitable site for the subsequent erection of a Church". On 1 January 1911, the Foresters Lodge Hall was purchased by the Church at a cost of £325. It was said that the hall would soon have to be transformed into a Church and extra seating provided. In the early part of 1913, All Saints' Church underwent extensive enlargements and the addition of a schoolroom. On Friday 20 June 1913, All Saints' Church was re-opened for dedication by the Bishop's Commissary Archdeacon Calder. 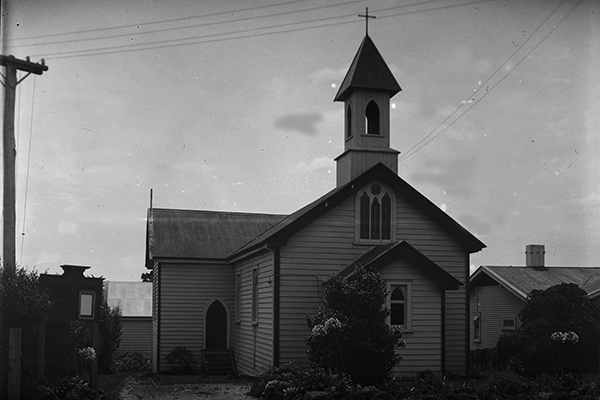 Services continued in the Church on the Highbury site until 1923, when the building was moved further down the Street to its present site at 187 Hinemoa Street. The building had to be first split into two sections - the upper floor (the main Church room) being removed from the Sunday School rooms underneath. Subsequently, the Sunday School room portion was re-assembled across the rear of the new site, so as the form the Parish Hall (today known as the Foresters Hall). The Church itself was repositioned in front; closer to the road. Due to having been built from the dissected hall, the stained glass windows in the church are not of a religious type. They depict an oak leaf, which relates to Sherwood Forest in England, hence the name of the original hall. These can still be seen in the church today.